The 1906 University of Florida Record predicted, "It may take a hundred years for the completion of these plans, but as the State grows…, the University will finally grow into a splendid and harmonious whole…." 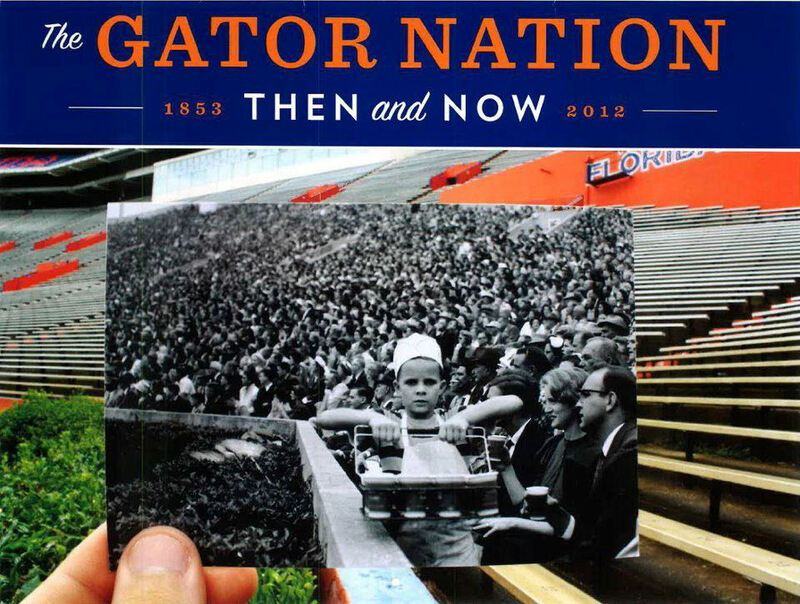 As one who has a deep interest in history and is a long-term University of Florida employee, it was only natural for me to try to contrast in photos the UF of today with the UF of yesterday. 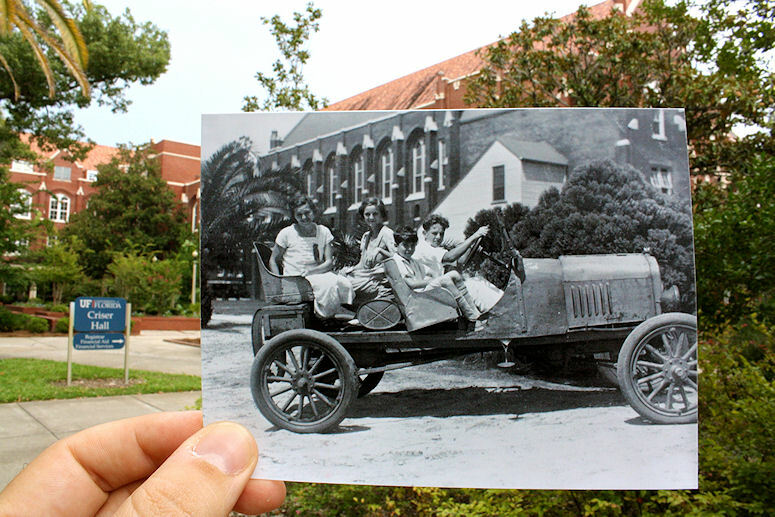 The UF, Then & Now photo project presents a unique opportunity to bring the past and present together in a way that serves to remind us of UF's own heritage and the many who have gone before us as students, staff and educators at this fine institution. Some of these photos presented quite a challenge. The University Auditorium, for example, has been added to extensively in the front and on both sides and Ben Hill Griffin Stadium/Florida Field has seen many additions since it was first built in 1930. 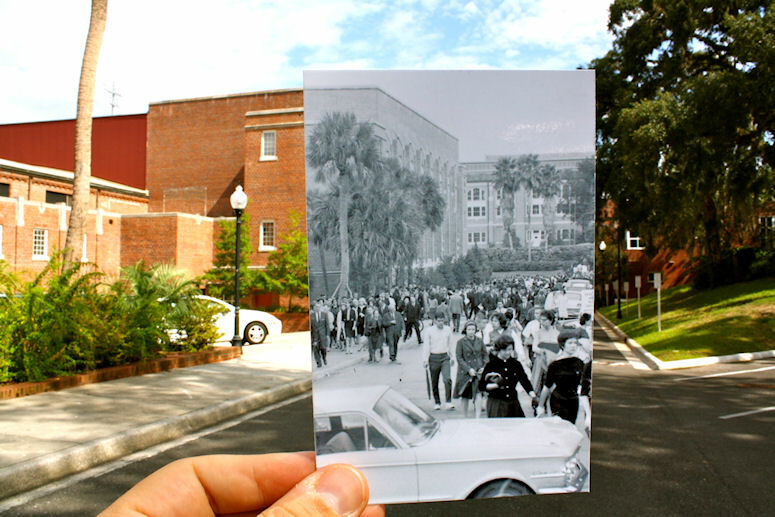 My favorite photos are of Sledd Hall, which still has a 'Trunk Delivery' window where student's trunks were dropped off and placed on a dumb waiter to be lowered to the basement for storage, and the students exiting Florida Gym after a memorial service for John F. Kennedy, a historic moment in time. Overall, though interior renovations have occurred, most building exteriors have not changed. The experience was quite rewarding and reminded me that the foundation of what has made this University a leading academic institution still exists in its people and buildings. 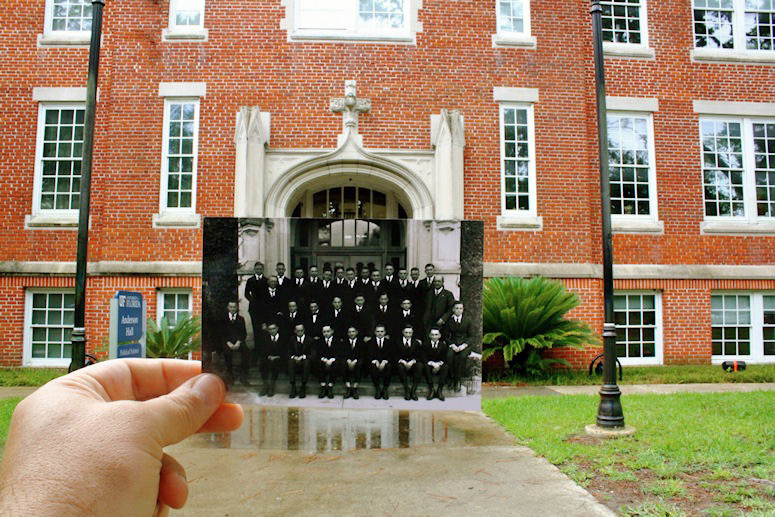 For more recent photos and a brief history of UF during WWI, visit SERIES 2 and SERIES 3 and UF & THE GREAT WAR. Additional history blogs and photos can be found at PAST PROLOGUE. 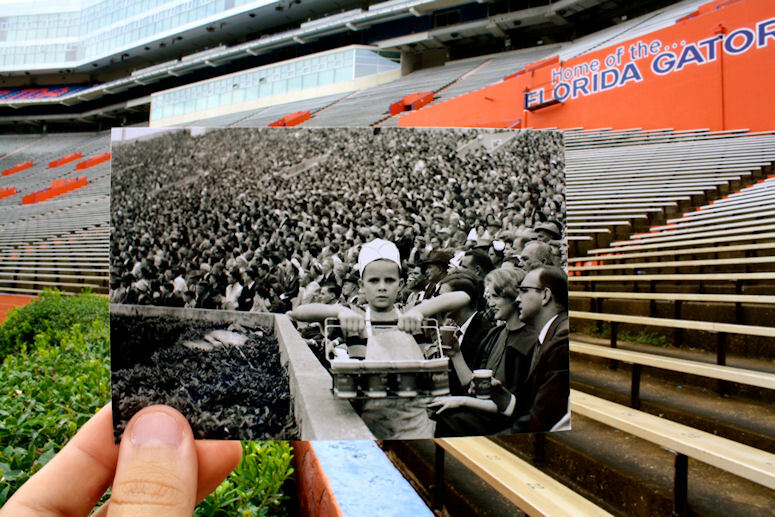 A young boy sells soda at a Gator football game in 1960. Originally called the Language Hall, Anderson Hall stood across the open plaza from Science Hall when it was completed in 1913. In addition to classrooms and offices for the English, Language, History, and Mathematics Departments, the building also housed the offices of the President, the Registrar, and the Graduate School. It is named for Dr. James Nesbitt Anderson, first Dean of the College of Liberal Arts and Sciences and of the Graduate School. 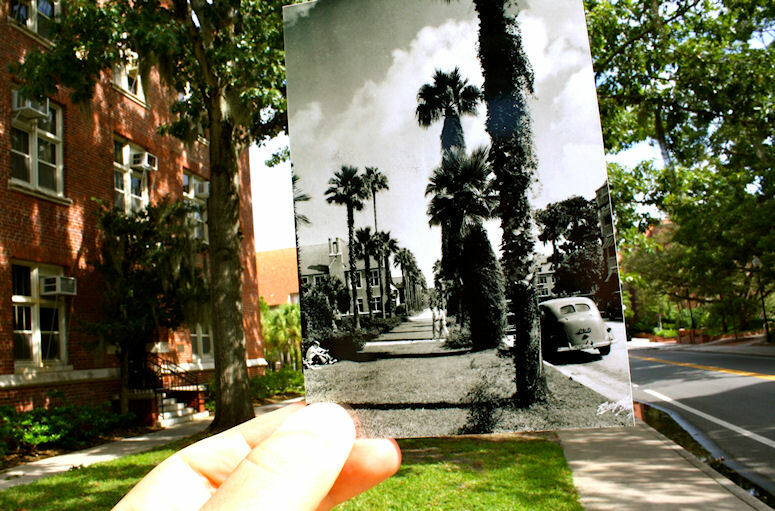 Dr. John Tigert, President of UF, stands in front of Newell Hall in 1944. Newell Hall was built in 1910 and was originally called the Agricultural Administration Station. The building was named for Wilmon Newell, Director of the Station from 1921 to 1943. Built as the Florida Experiment Station, Newell Hall represented the close link between the academic mission of the land-grant university and practical agricultural services to the growers and farmers of the state. 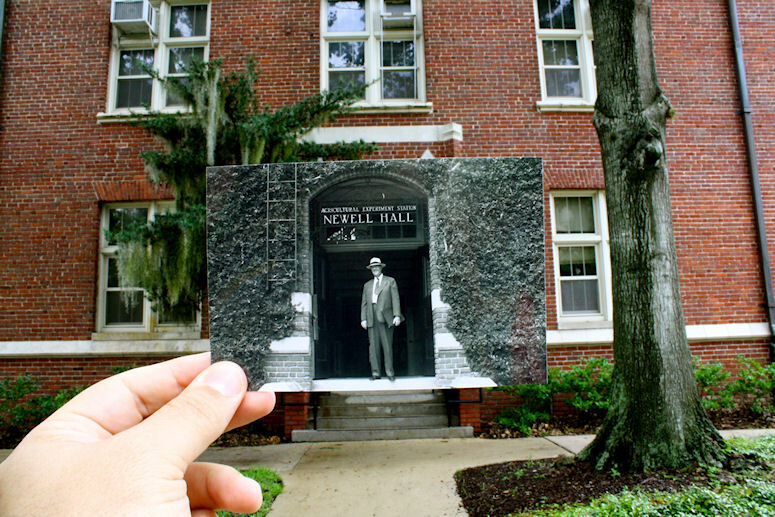 A restoration of Newell Hall was completed in 1944, the only major campus construction project completed during the Second World War. Smathers Library, formerly Library East, was completed in 1926. This photo, though year unknown, would be near that time. 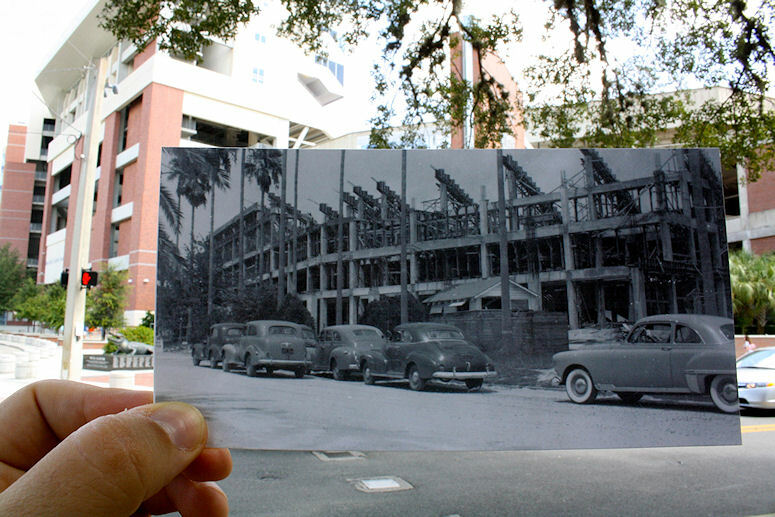 The white structure in the old photo is no longer there. There were additions to the library in the 1950's. 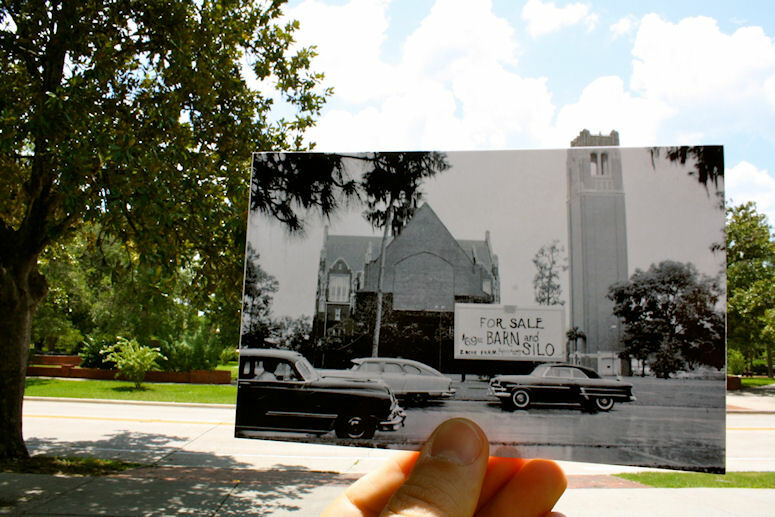 The Smathers Library now contains special collections. Looking north on Buckman drive around 1950. Today the Palm trees are gone replaced by other trees. Peabody Hall in the 1920s. The Peabody Foundation contributed $40,000 toward the construction of this building to house the Teacher's College. It was constructed in 1913. It remained the home of the College of Education for many years and accommodated a psychology lab, the presses of the Florida Alligator and the library collection. Later the College of Architecture and the Departments of History, Political Science, Economics and Sociology used Peabody Hall for faculty offices and classes. The building was renovated and converted to administrative and student services use in 1990. Construction of the west stands, August 1950. Ever evolving, new athletic offices and a sports museum exist just behind the photo. 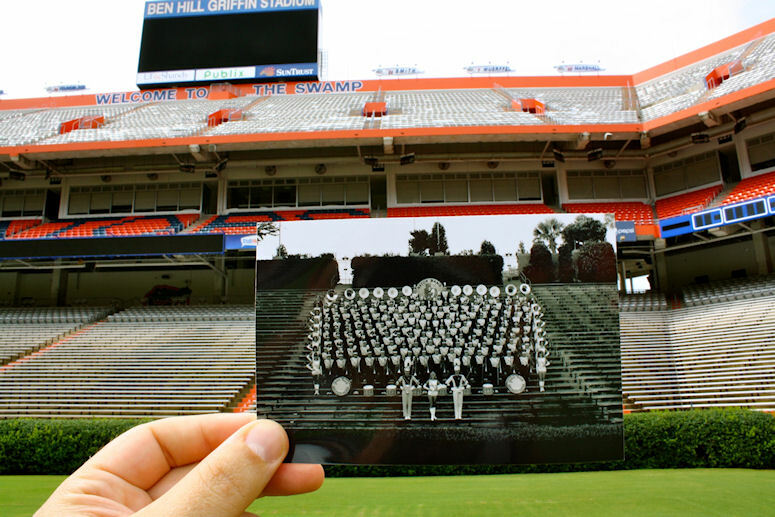 The Gator Band photographed at the north end zone Florida Field (year unknown) before upper decks were added. The north entrance had a hedge, iron gates and a brick wall. Much has changed, however, the band still sits in the same area. 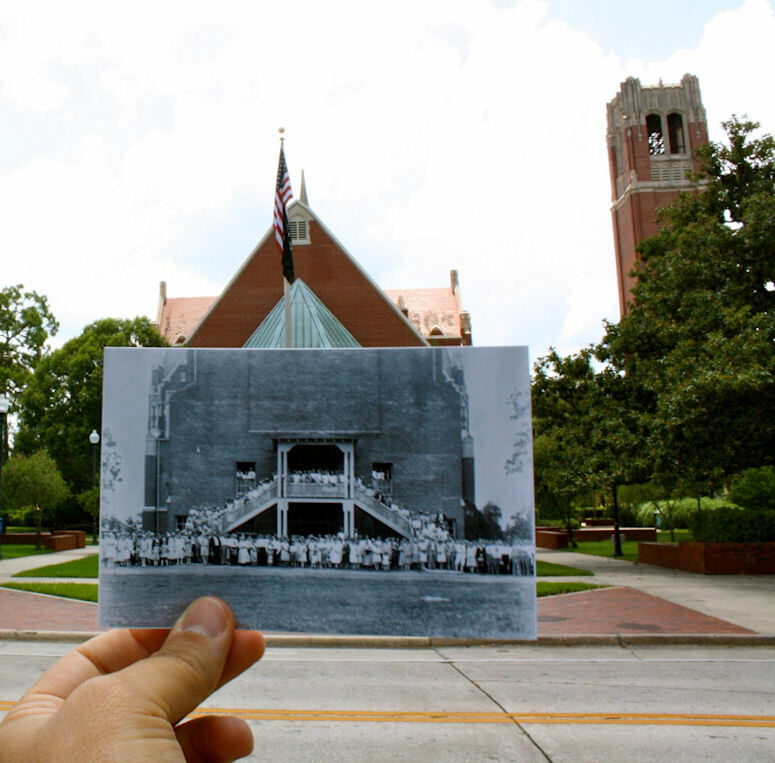 Students leave the Florida Gym after a Memorial Service for John F. Kennedy in 1963. 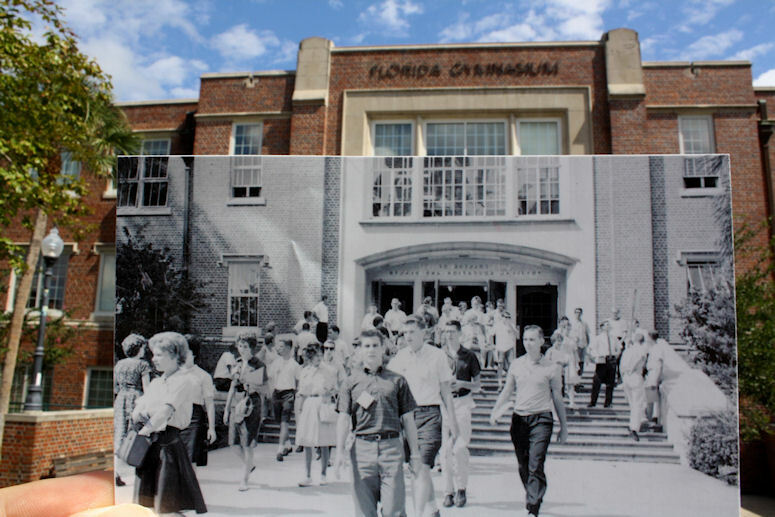 The Florida Gym opened in 1949 as a 7,000-seat multi-purpose arena that was home to the Florida Gators men's basketball and a venue for events.While serving as the home court of the Gators basketball team, it was also known as 'Alligator Alley.' The building was rehabilitated for use by the Department of Recreational Sports and the College of Health and Human Performance. 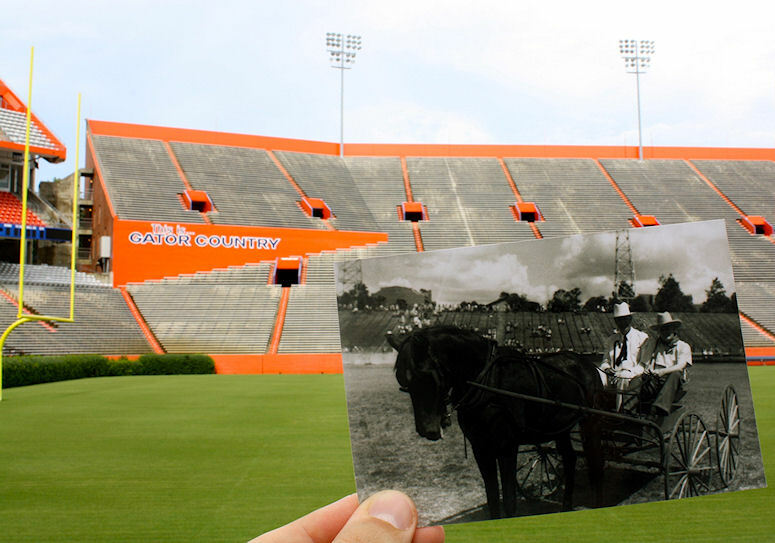 Former UF president, Mr. John Tigert sits in a horse drawn carriage on Florida Field 1943. Dr. Tigert, before becoming UF's president, was a former head football coach at the University of Kentucky. He was the driving force behind construction of Florida Field in l930 and actually chose the location of the field. There was no state funding for the new stadium, so Dr. Tigert and a few friends went out and personally raised the funds, setting up a method to solicit and manage them within the framework of University Athletic Association, Inc. The original stadium cost $118,000. 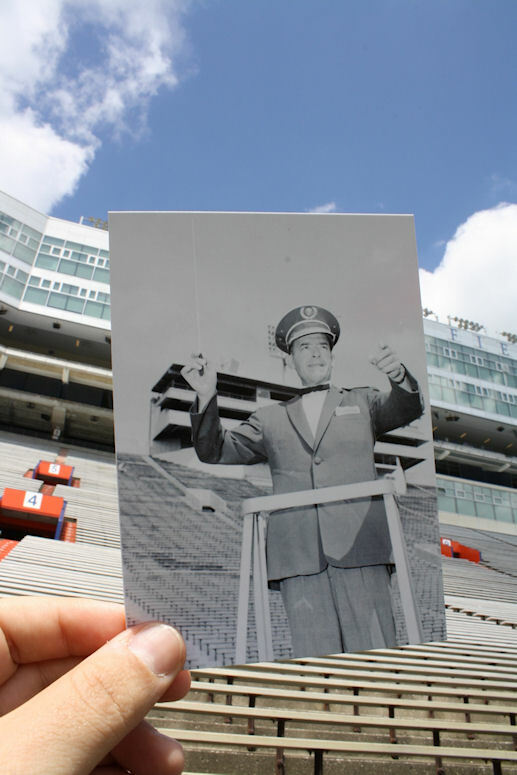 The stadium has gone through extensive renovations over the last 60 years. 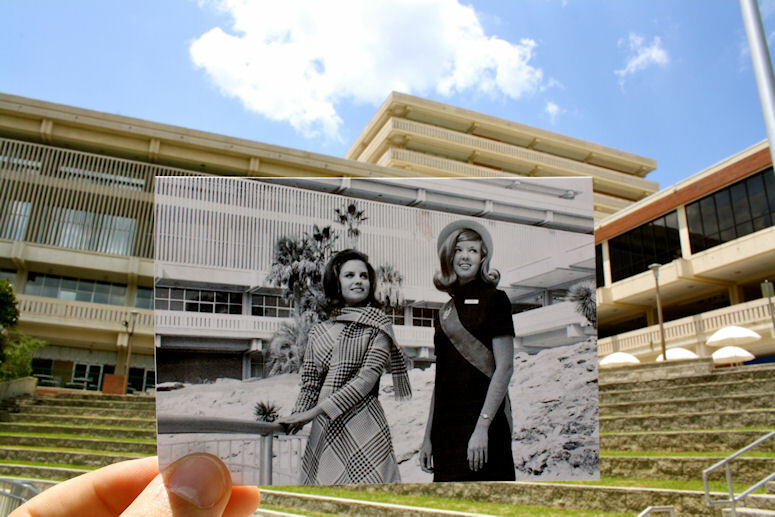 Students pose in front of the Reitz Union 1967-1969. The Reitz Union was constructed in 1967 and named for Dr. J. Wayne Reitz, President of the University from 1955-1967. University Auditorium and Century Tower in 1959 with an interesting 'For Sale Barn and Silo' sign out front. 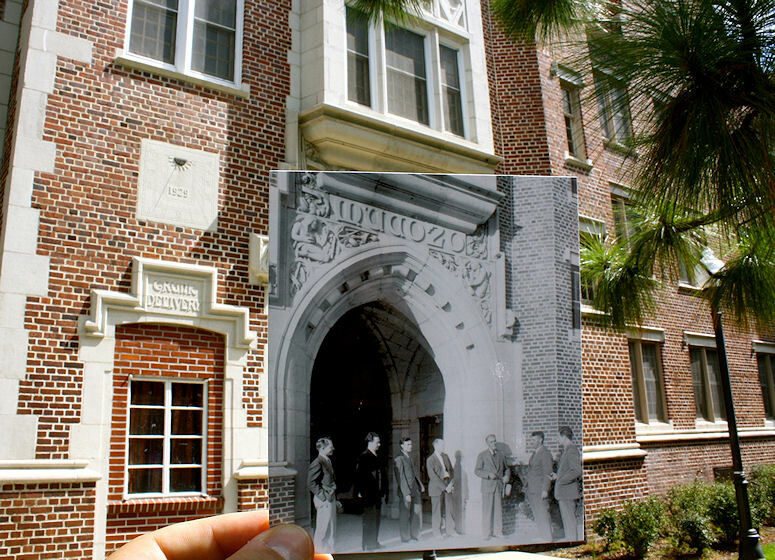 Men stand at the entrance of Sledd Hall around 1950. Sledd Hall dormitories, built in 1929, have sculptural figures along the cornice that depict the all male student population of the period engaged in a variety of activities. An outstanding feature of the building was the Mucozo Tower South entrance (seen above) to the dormitory courtyard. The sculptural features recognize the friendship of Chief Mucozo and Spanish explorer Juan Ortiz. The tower also included a trunk depository (to the left of the entrance), where students' luggage was loaded on a dumb waiter to the storage level below. 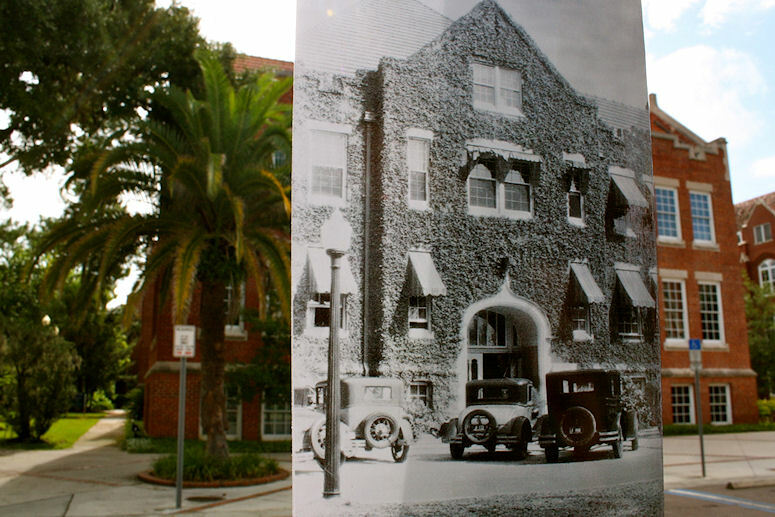 Sledd Hall was named for the first UF president, Dr. Andrew Sledd. Students in front of Anderson Hall. 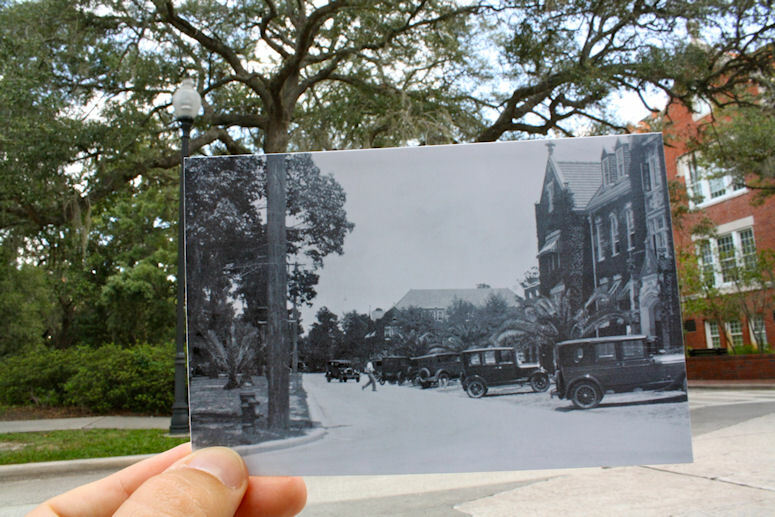 Originally Language Hall, Anderson Hall stood across the open plaza from Science Hall when it was completed in 1913. In addition to classrooms and offices for the English, Language, History, and Mathematics Departments, the building also housed the offices of the President, the Registrar, and the Graduate School. It is named for Dr. James Nesbitt Anderson, first Dean of the College of Liberal Arts and Sciences and of the Graduate School. 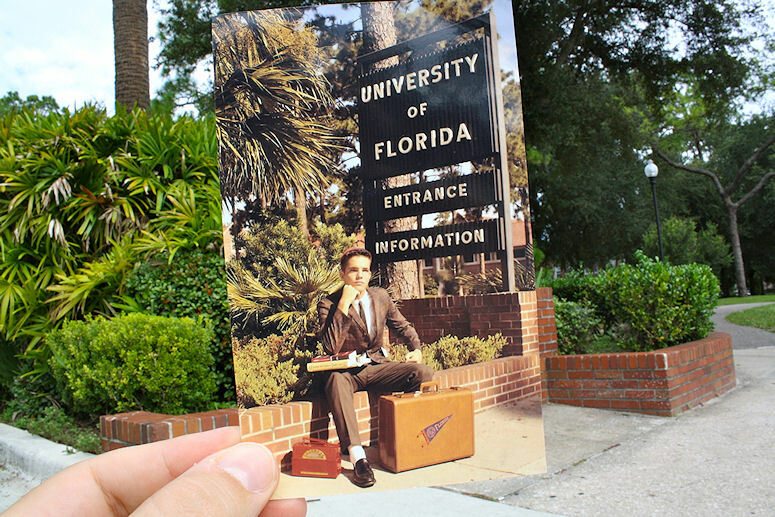 1950's photo of UF student. Probably a photo shoot for the undergraduate catalog. Today, the bricks are gone. Students leaving the Florida Gym. 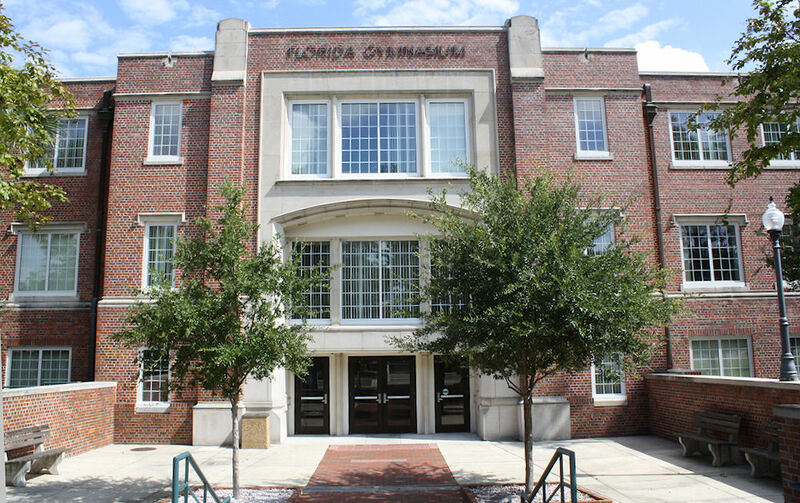 The Florida Gym opened in 1949 as a 7,000-seat multi-purpose arena that was home to the Florida Gators men's basketball and a venue for otherevents. While serving as the home court of the Gators basketball team, it was also known as 'Alligator Alley.' After renovation the entrance is now a floor below where the students are exiting. According to the photo HERE, the students would have been exiting through the middle windows. Dr. Richard Bowles, professor of music at UF for 27 years, directs the band on Florida Field in 1962. A much larger press box. Dr. Bowles died in December of 2009 at the age of 91. A view of the University Auditorium's north entrance in the 1920's. The building was built in the early 1920's. The front entrance seen at the top of the photo was added on in the 1970's.